I remember the anticipation of Christmas and the excitement building up to the point where I knew I would not be able to fall asleep. The cure? 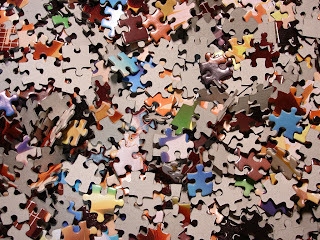 Putting together a puzzle. 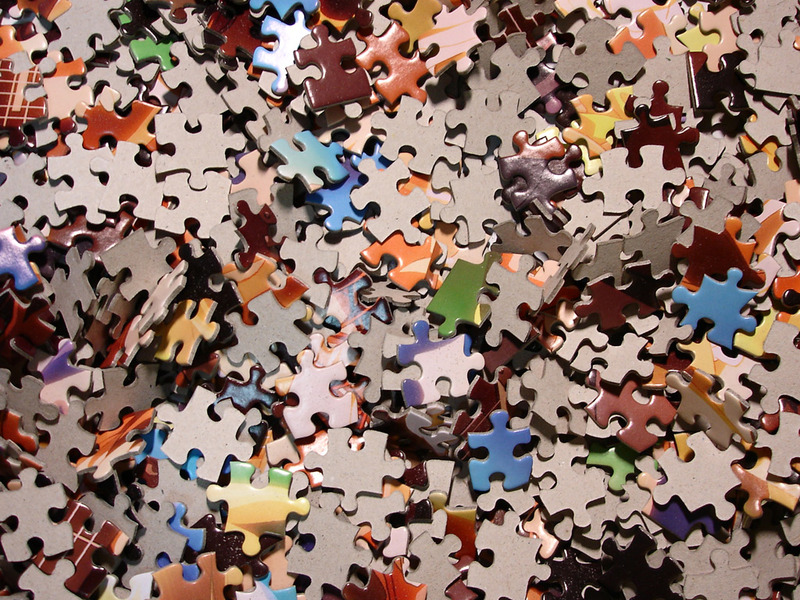 We would gather around the rickety cardboard table in front of the fireplace on Christmas eve, working mindlessly to put together a puzzle and sipping hot chocolate. It became a yearly family tradition, keeping our fingers and minds busy, passing the time ever so quickly. 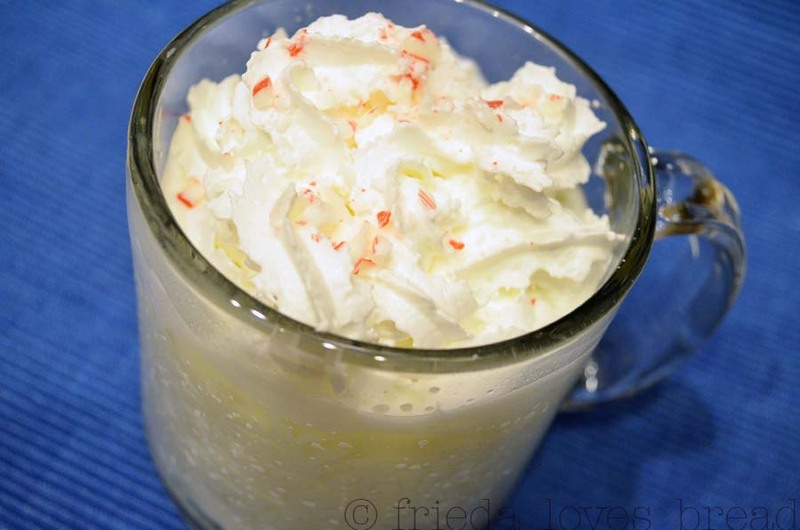 This Snowflake White Hot Chocolate uses very simple ingredients that you can change up however you want ~ top it however you want. 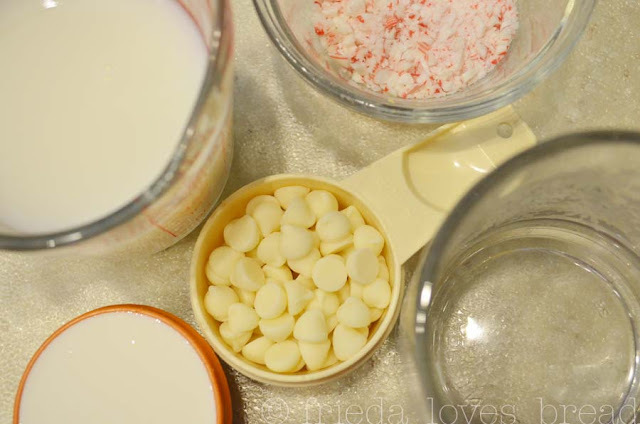 make a "single serve" recipe just in case you find yourself chilled and craving a cup of velvety smooth hot chocolate ... it takes less than 5 minutes to make! 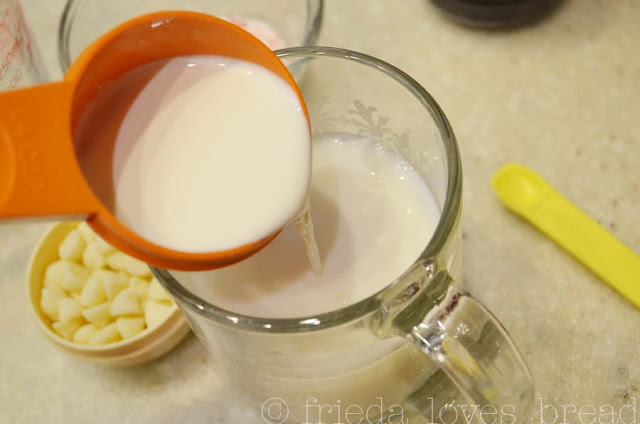 Pour half & half cream into mug filled with skim milk. If you wish to have a thicker, creamier hot chocolate, by all means, use heavy whipping cream and whole milk. I won't tell anyone ... remember, it's YOUR very own cup of hot chocolate! 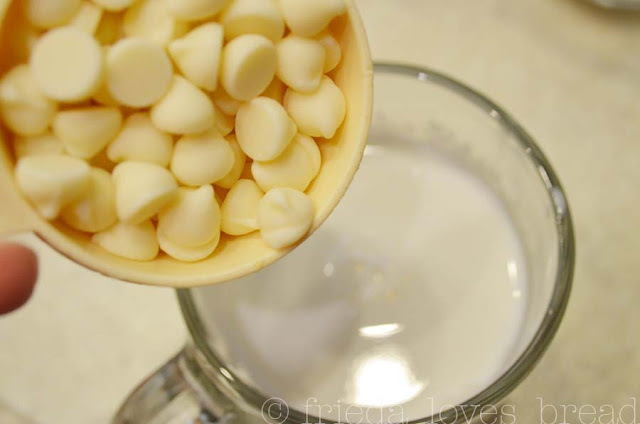 The milk is heated in the microwave and then the chocolate chips are added. Not a fan of white chocolate? Then add your favorite: milk, semi-sweet, bitter-sweet or special dark. Here, I am using Guittard's Choc-Au-Lait real vanilla chips. The chips are stirred till they are mostly melted. Put the mug back into the microwave for 20 seconds. At this point, you can choose which flavoring(s) you wish to add: vanilla syrup, homemade caramel candies, or peppermint extract. The choices are endless. ... and with every soothing sip, I felt all the memories of putting together a puzzle in front of the crackling fire. Ooooo, yummy! It has actually been cold around here... Well, cold for us, anyway. I'm going to try this before it warms up. Quick! This looks like the perfect festive winter drink. Happy new year!